England was a small island nation off the coast of the very powerful and dynamic continent of Europe proper. There were three options open to the English ruling classes. First of all, she could immerse herself into European politics and economics. However, the competition on this front was particularly fierce; French, Italians, Austrians and a myriad of other powerful nations would ensure that England would only be one player in a field of many. Besides, wars and religion made dabbling in this arena a very expensive one. Second, she could turn in on herself and try to stay aloof from the goings on of the world. This strategy suited the Japanese in their dealings with their continental rivals. However the English were already keen traders and had acquired tastes and business practices that made this option an unpalatble one. Her third choice was to turn to the opportunities offered by the rest of the world. And it is because she chose this path that first England, and then Britain, turned herself into the preeminent maritime nation of Europe and indeed the world. England's rise as a maritime nation started with the reign of King Henry VIII. His ambitions were guided more to Europe, but he did manage to lay down financial and military foundations that would be taken advantage of by his successors. The Mary Rose is testimony to the size and power that the King sought to develop. He wanted a navy to project his power and influence onto the European political scene. Unfortunately, his plans and schemes were not fully realized during his reign. However, his treasury was full, the ports were protected by new castles and coastal defences and he had started a naval tradition that would bequeath valuable skills and experience to later generations of seagoers. By the time Queen Elizabeth came to the throne, the most powerful maritime nations were Spain and Portugal. These nations had encouraged explorers to find new, exciting and highly profitable trade routes. However, there were deep religious and philosophical divisions between these Catholic nations and the Protestant English. Queen Elizabeth had no love for these religious and economic rivals and basically sanctioned piracy on the high seas as a means of prosecuting war against the Catholic monarchies. Chief amongst her officially sanctioned privateers were Sir Francis Drake and Sir John Hawkins. These, and other sailors, wreaked havoc with Spanish and Portugese trade routes to the East Indies and particularly to the New World. The Caribbean became particularly notorious for rampant piracy. This rivalry turned into something of a naval arms race as the Spanish and English tried to outdo each other in terms of offensive power or in terms of speed to escape potential privateers. Military and commercial ships of both nations would benefit from new technologies, techniques and skills. The naval rivalry between these two nations would reach a head in 1588 with the Spanish Armada. This Spanish attempt to stamp out her English rivals was a gamble that did not pay off. Bad weather and English seamanship saw that the Armada failed in its bid to land an army on English soil. More importantly, the destruction of much of the Armada left the English mariners in a very powerful position and particularly in the Caribbean and in the New World. In the East Indies with its spice trade, the English still had to deal with the Portugese and the Dutch as serious competitors. But with the removal of the Spanish, the English were free to develop an unprecedentedly successful economic venture. There were two main commercial activities that allowed the English to maximise there maritime advantage: Sugar and Slavery. In fact, these were two complemantary activities that would work very closely together. Slaves were needed to tend and harvest the sugar crops of the New World. The same ships that transported these slaves could then be loaded up with sugar and brought back to Europe. With the advent of industrialisation in Britain, the third leg of this trip could also be made profitable. Cheap manufactured goods were taken from Liverpool and Bristol to West Africa and exchanged their for slaves, the slaves were exchanged for sugar in the Caribbean, and the sugar would finally be sold in Europe at a huge profit. The profits involved meant that few people overly concerned by any humanitarian or ethical issues. Indeed, the economic success of this trade would mean that even more time, money and skills were ploughed into the British commercial and Royal Navies. The more and better the British ships became the more she took the world's trade and the faster she developed into the world's preeminent naval power. By the mid to end of the Eighteenth Century, the British could claim to have the largest and most successful naval forces in the world: Both militarily and commercially. 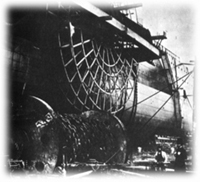 By this time, naval traditions, experience and expertise had been fully augmented by advances in science and the latest industrial products and techniques. British ships were familiar sites to ports and coastal regions the world over. However, two events would test this faith and confidence in the maritime forces of the nation. Soon, the British would realise that although they were a match for any nation on even terms, a combination of forces might lead to her undoing. The first test of this theory was the American War of Independence. French and Spanish involvement in supplying and maintaining the insurrection. Combine this with Royal Naval ships and sailors fighting on the side of the colonists and the British could see that they were not as invincible as they would have liked to have believed. However, the real test of the strength and importance of the Naval forces of Britain was to come with the rise of Napoleon on the European continent. A brilliant tactician and strategist, Napoleon swept most of Europe before him. As he took effective control over these powers he also took control of their navies. The British tried their best to thwart these plans with some success in Holland and especially Denmark. However, the Spanish and French fleets combined again to form a most formidable force. Unlike the days of the American War of Independence, it was clear that the only way the British could dispense with the threat of Napoleon was to confront and defeat this Navy in an open battle. The stakes for the island nation had not been higher since the days of Drake and the Spanish Armada. Fortunately for the British, a new hero rose to the hour. Admiral Nelson successfully defeated the combined fleet at the Battle of Trafalgar. He paid for this victory with his life, but he laid down a sense of security for the island nation that would remain intact for another century. Although disappointments and setbacks did occur, most notably in the War of 1812-14, essentially the Royal Navy returned to being the preeminent maritime nation. Indeed, the only serious threat to the Royal and Merchant Navies were the sailors, captains and admirals themselves. Complacency and a lack of serious rivals meant that the British maritime forces lay essentially unchanged for most of the Nineteenth Century. 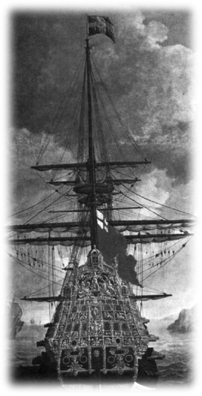 Half a century after the death of Nelson and the Royal Navy had barely changed at all; even the ships were the same. The only serious innovation that made serious inroads into these traditions was the advent of steam. Even then, the Admiralty were reluctant converts to this latest technology and pined for the days of sail. It would be left to commercial forces and entrepreneurs to explore and develop this means of power. The most important name associated with these developments is that of Isambard Kingdom Brunel. This man built the first steamship to cross the Atlantic: the Great Western. 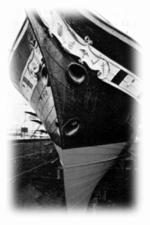 The first ocean screw steamer: the Great Britain. And what for 40 years would be the largest ship ever built: the Great Eastern. And although these ships were not the greatest of commercial triumphs the combination of ingenuity, expertise and industrial technology would mean that Britain would remain at the forefront of maritime power for some time to come. Steam power would open up other avenues for exploration that had previously been difficult if not impossible for mariners to pursue. The ability to power a vessel upstream would mean that many of the world's rivers could be opened up to European explorers and traders. This would allow for new parts of the world to be explored and new commerical and political relationships to be established. Africa would see this technology employed along its many rivers. Indeed, steamships would even be taken overland to operate on the great lakes of the African interior. One side effect of the introduction of steampower was that coaling stations would become a strategic necessity to the Royal and Merchant Navies. All of a sudden, the Royal Navy became concerned at the placement of Naval bases particularly with regards to how far a ship could steam before it needed refuelling. This new strategic thinking would be augmented and amended by the opening of the Suez Canal in 1869. The world was becoming a smaller place at a rapid rate and maritime necessities would be prime in consideration for much of the Imperial expansion of the day. Cash crops would be the new cash cows that provided the financial impetus for maritime ventures at the Imperial level. Tea, cotton, rubber, even opium would all take their turn in providing the imperatives and returns in investing in Britain's maritime fleets. Combine these financial considerations with regular British trade patterns with Europe, Latin America and the United states and the fact that populations were willing and able to move about the planet in unprecedented numbers and the importance of ships and maritime policy to the British Empire is easy to comprehend. The next challenge to British supremacy of the waves was to be by the Germans. By the end of the nineteenth and the beginning of the twentieth centuries European and imperial rivalries combined to form ominous and powerful blocks of nations. On one side lay the French and Russians, on the other the Germans, Italians and Austrians. Britain tried to remain aloof for as long as possible, but when the Germans declared that they wanted a Navy that was the equal of the Royal Navy, the gauntlet had been laid and the British joined with the French and Russians. A naval arms race between the British and Germans was proving costly to both countries, it didn't help matters when one of Britain's own innovations nearly bankrupted the nation. The development of the Battleship Dreadnought in 1906 kept the British at the front of Naval technology but at the cost of making their entire existing fleet obsolescent. The Germans would easily be able to catch up to the British with this new technology and, if it hadn't been for competing claims on the German military budget, might have succeeded in doing so. As it was, during The Great War, the British were just able to keep ahead of the Germans and successfully bottled them up in their Baltic ports for most of the war. However, another military development would provide fresh worries and portents enough for the British. The submarine did not effect the war as much as their German commanders had hoped, but their potential for disrupting existing Naval balances of power were clear to all. These concerns would be played out at a much more lethal level during the next war. Meanwhile, the interwar period saw cutbacks to both the Royal and Merchant Navies. With little appetite left for armed forces, British politicians cut back defence expenditure on all of the services. The Royal Navy was no exception. These cutbacks came just as new maritime rivals could be seen on the horizon. During The Great War, the Americans had turned their massive industrial might to outfitting her armed forces in a very short period of time. At the same time, the Japanese had been left unchallenged to develop in the Pacific Ocean. When the war ended they quickly sought to establish some kind of parity with the Royal Navy; the result was the Washington conference. This conference established the so called 5:5:3 ratios for capital ships. America and Britain were to be equal in size and number of ships whilst the Japan maintained 60% of these numbers. The effect of the conference was that Britain, for the first time since Drake, admitted that she would only be the equal of another power. No longer would she aim to be the preeminent naval power. In reality, she had also given the Japanese a local superiority in the Pacific region. A superiority the Japanese would use to dismember much of the British Asian Empire. The Second World War was to put Britain in as much, if not more, peril than in the first. Her naval commanders rightly identified submarine warfare as being the biggest threat the island nation. The Royal and Merchant Navies took horrendous losses as these commanders developed ways of dealing with this silent menace. Convoys and ASDIC did most to redress this balance. But it was a long, hard fight and one that left Britain militarily and economically exhausted by the end of the war. Britain would never reclaim its former maritime glory. The United States and Soviet Navies would eclipse the Royal Navy in size, technology and power. Aircraft carriers, nuclear submarines and the rise of Air Power in general would mean that the strategic balance had been tipped forever. Withdrawal from Empire speeded up this process even more, bases in the Far East, South East Asia, the Middle East and even the Mediterranean seemed like expensive anachronisms that no longer served any purpose. At a commercial level, the rise of air transport killed off much of the passenger business of the shipping lines. Also, new trade patterns were established as Imperial trade was replaced by much shorter European destinations. The fall from grace of the British naval heritage is only so precipitate when you realise how long and how deep that tradition has been the lifeblood of the nation. Generations of citizens grew up with the unquestioning belief that Britannia Ruled the Waves. Now that she is a middle ranking European nation, it is not hard to see why so many people lament the passing of an era and why it inspires so many more to be fascinated and interested in this area of British history.